Featuring a number of impressive designs and numerous finishes the Secured by Design Super Wide Angle Door Viewers range at UAP Ltd will look fantastic on any Composite or Wooden door! Door viewers (spyholes) are a great security accessory for your customers, as no door should be opened without first checking who is on the other side. Door security is essential to ensuring a home is safe and once quality locks have been fitted it’s key to have a door viewer. Many homeowners overlook the importance of really seeing who is on the other side of the door and essentially this can actually be the best way to prevent unwanted guests, break-ins, and scams. Providing your customers with this important information will help them learn to better protect their homes and keep intruders out. Each spyhole has gone through rigorous testing, and have each been tested to DHF TS002:2009 which covers Corrosion Resistance, Security (Angle of Vision), Visual Clarity, Resistance to Misting Up, Ability to Clear After Misting, Length Adjustment Range and Marking. The door viewers have also been awarded ‘Secured by Design’ by the Association of Chief Police Officers. With a variety of super wide angle door viewers homeowners will be able to select the viewer most suitable for their needs and overall home interior and exterior. Whatever their overall door hardware finish is there is a spyhole suitable to match it. Made with a solid brass body, and comprising of 3 plastic lenses, each spyhole ensures to give crystal clear performance for years of safe, secure use. As standard, super wide angle door viewers are salt spray tested for a minimum of 480 hours, and comes with a 5 year inland coating guarantee. Polished brass door viewers come with a PVD head, which helps prevent rust developing in coastal areas and also come with a FREE privacy cover! 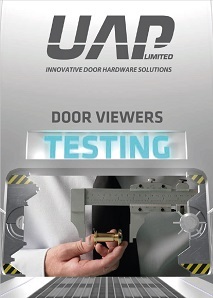 This machine tests the corrosion resistance of the door viewers. The salt spray cabinet produces a corrosive environment, by releasing a dense saline fog into the chamber which the products are exposed to. This creates an accelerated corrosion of the product and allows us to test how well the door viewer would stand up in harsher environments. The door viewers are tested for differing lengths of time depending on the standard requirements; 480 hours for brass, zamak and aluminium based door viewers where we offer a 5 year inland coating guarantee, and in the case of stainless steel Nanocoast door viewers, we test for 2,000 hours where we offer a LIFETIME coating guarantee anywhere in the country, as the door viewers will not pit or rust. 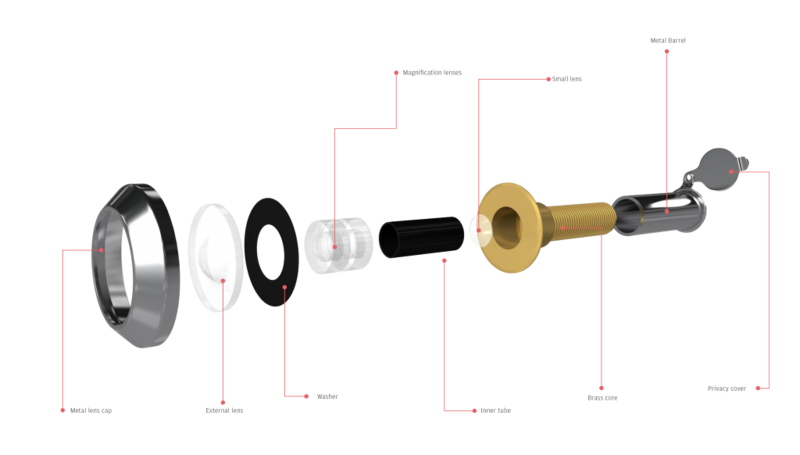 When placed in the all-weather machine, the door viewers are subjected to conditions including high UV exposure using a Xenon Arc Lamp which will accelerate UV degradation and measure how well a door viewer can last in extreme conditions. Other conditions such as rain and extreme heat can be generated by the machine to expose door viewers to all kinds of environments. This allows us to continually improve the door viewers and make them so they last longer in all kinds of different environments. In order to meet Secured by Design specifications a door viewer must have a viewing angle of 120 degrees (60 degrees on either side). To test the angle of vision, the door viewer is fitted to a wooden block with a thickness of 45mm. The block is then fitted onto a protractor which is visible through the door viewer. The tester must look through the viewer and follow a stick, which they are holding, around the protractor until it is only just in sight through the viewer. This point must then be marked and the process is repeated on the other side. The test is conducted in accordance with DHF TS002:2009 standards. 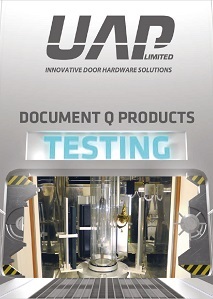 Door Viewer was subjected to a neutral salt spray test as detailed in BS EN 1670:2007 for 96 hours (grade 3). The door viewer was mounted, in accordance with the manufacturer’s instructions, to a 45mm thick (+/-1mm) wooden block which, in turn, was mounted perpendicular to a protractor. Whilst looking through the door viewer, a point source of light was moved into view and the angle at which it first appeared (measured from a datum perpendicular to the “door” face) was noted. The test was repeated from the 180° opposite position and the two readings were added together to give an average “viewing angle” for the cone of vision. The door viewer was mounted in a suitable test-rig in which the viewer was held perpendicular to a sheet of text at a distance of 150 mm. Using normal or corrected normal vision, in good light, attempts were made to read text in progressively smaller point sizes and the smallest point size that could be read was noted. (The font used was Arial Black – regular, printed using Microsoft Word). The door viewer was mounted, in accordance with the manufacturer’s instructions, to a 45mm thick (+/-1mm) painted wooden block – representing part of a typical external door to a dwelling. This, in turn, was mounted in a test-rig in which the viewer was held perpendicular to a sheet of text at a distance of 150 mm. Using normal or corrected normal vision, in good light, attempts were then made to read text in progressively reducing font sizes and the smallest point size that could be read was noted. The wooden block was then stood upright in an environmental chamber and subjected to 72 hours of cyclic humidity to BS 3900-F2:1973. Immediately after the humidity test, the readability test was repeated by the same person. Following the humidity test, the door viewer (still in the wooden block) was allowed to dry out for 72 hours at 30° C, after which the readability test was repeated by the same person who carried out the initial test. The door viewer was screwed up to its shortest length and the distance between the mounting flanges noted. It was then unscrewed so that there was a full turn of engagement on all threaded connections and the distance between mounting flanges was again noted. 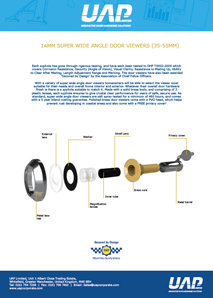 UAP Ltd distribute a wide range of door viewers, made from brass, aluminium and Nanocoast 304 or 316 grade stainless steel. Coating Guarantee = the sooner of “the guarantee supplied for the door or window from the manufacturer” or “5 years inland” on brass and aluminium based door viewers or “Lifetime” on Nanocoast 304 or 316 grade stainless steel based door viewers. 1. The door viewers are applied to a door or door panel, and no item of door furniture on the door or door panel are sealed or fixed using any form of silicone sealant or the like. 2. The door viewers are fixed correctly and the right way around using the correct fixings, and are not scratched or damaged at any time during the installation process or thereafter. 3. Nanocoast 304 or 316 grade stainless steel based door viewers are cleaned with a lemon based very mild soap solution and a soft cloth once a month, or every 2 weeks in areas of high sea salt such as coastal areas. At no point should any form of cleaning agents be used. 4. Brass and aluminium based door viewers are installed inland (defined as 25 miles from the coast or 5 miles from highly populated industrial areas) and are cleaned monthly with a moist cloth. At no point should any form of cleaning agents be used. 5. No claim will be accepted for any door viewer that is scratched or mutilated or fitted incorrectly. 6. The guarantee only applies if the door viewer is fixed to the original door for which it was bought and fitted by the installer. The guarantee will cease immediately if the door viewer is removed from the original door or door panel. 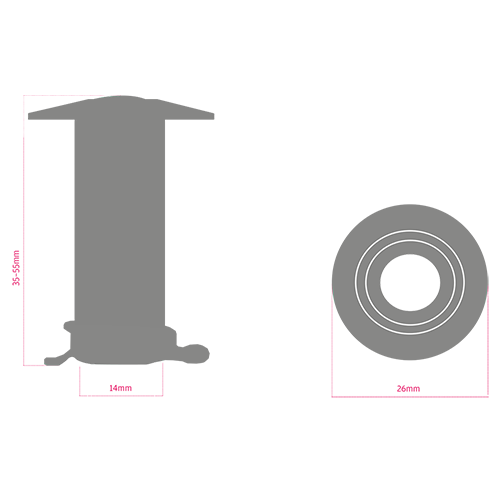 Mechanical Guarantee = the sooner of “the guarantee supplied for the door or window from the manufacturer” or “5 years inland” on brass and aluminium a based door viewers or “10 years” on Nanocoast 304 or 316 grade stainless steel based door viewers. 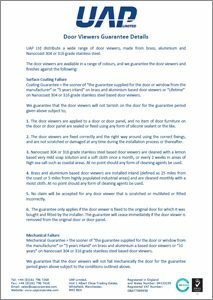 We guarantee that the door viewers will not fail mechanically the door for the guarantee period given above subject to the conditions outlined above.